Source: Review copy received from the author – thank you! Neil — A week before his car crash with Felicia, Neil spends a perfect day at the swimming hole. He and Felicia have never been happier. But can he work up the courage to tell her that he loves her? Julian — Months before the events of THE MEMORY OF AFTER, Julian and Mira spy on Felicia and Autumn during a trip to Iceland. Libby — Character first introduced in CHASING BEFORE. Libby and her boyfriend Jeremy head off on a road trip to Las Vegas and stumble upon truths potentially deadly to their relationship. Brady — Character first introduced in CHASING BEFORE. An unexpected encounter with the charming Oliver brings cancer-patient Brady out of his shell. I’m usually not a sucker for novellas. I mean, it is not as if I did not like to read them or something, but I always find it so hard to get into the story, especially when you know there might be sudden ending to the story. With The Best Things in Death, it was different. I am not lying when I say that Level 2 (I do believe the book has got a new title now, but I cannot remember it right now and could not find it on Goodreads) was one of the weirdest books I have ever read — and I do not mean weird in a bad way. I fact, I was really fascinated by the way the way the story was told: through flashbacks. Oh, and did I mention that I am a die-hard Neil-Felicia shipper? When I found out that both characters would be featured in the novella I think my heart leapt for joy! I do not exactly remember if the same narrative style was also used in Level 2 but each character’s point of view is written from the third person point view, present tense. I usually find it really hard to get used to it because the feeling is simply awkward which is why I had some troubles getting into the story. I did not feel like an integral part to the story as a reader; it was rather like reading Neil’s thoughts through jerky sentences (his flashback is featured first). The tense generally simply did not flow. However, once I got used to it I had so much reading each individual story! Basically, Appelhans knows how to play with the readers’ feelings. I do not know what I was thinking but I actually expected some quick and fun read without any depth or something. But man, I was so wrong! 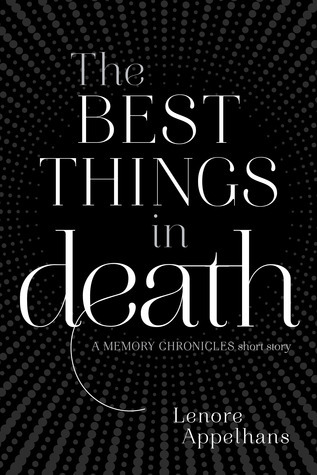 There was a seriousness in each of the individuals’ stories, making the title The Best Things in Death almost nostalgic and wistful. The first story involves Neil and Felicia, both spending a perfectly happy day at the swimming hole together. If I had to sum up his memory with one word, it would be sweetness. I really felt Neil’s longing to overcome his own doubts and fears just to tell Felicia he loves her. There was a simplicity and yet heartbreaking thing in the story I definitely did not see coming and it took me pretty off guard. Same goes with Story No. 3: The story actually deals with a young guy cancer patient. My first instinct: WTF? That was not even mentioned in the synopsis! But I really grew to love Brady’s story with Oliver, seeing them open up to each other, especially Brady: The moment where he realizes he does not hide all his secrets and not-so-perfect side was just so heartwrenching, and I really found myself falling for their story. The second story also really gripped me right from the beginning. It is about a college girl called Libby who is on a road trip with Jeremy, her boyfriend, to get married in Vegas. I do not want to tell you much about this story, but you just clearly know right from the beginning that their relationship is foredoomed to failure since they simply do not share an equal relationship. Her life is dominated by him. However, I did not feel aggressive or something when the ultimate disaster happens (she is obviously blind with love), I just felt sorry for her since the author perfectly knows how to capture the character’s twisted feelings. Which leads me to Story No. 4. My heart breaks when I think of Julian. I have never seen this soft side Julian before (of course it is already indicated in Book 1, but the feeling is definitely not the same. It was so interesting to see Felicia from his POV!) and the moment I shut the book, melancholy swept over me because the story was jst so beautifully written. The story is more than about unrequited love. Just like the other three stories, it deals with failure, but also with moving on and appreciating all those small little things in everyday life. Appelhans’s writing really improved from page to page and I found myself drowning in the book. Also, I really loved the way the author described all those small little details in the book; the way she depicts the places and settings where the stories takes place (->> Iceland for the win!!). That being said, there were always those glimpses of hope and joy in the book and ultimately, I do believe the author manages to “convey” the meaning of the title. The book enhanced my admiration for Appelhans’s writing since it was so easy to connect with each single character in the book! And now, please excuse me while I’m busy to find my own copy of Chasing Before. Thank you, you’re the sweetest! ♥ Ha, neither did I, but turned out those short stories were pretty cool despite their length…idk, but the author managed to put some depth into those stories somehow which I defenitely didn’t expect!